True Grit is an assemblage sculpture exploring sexual attraction, power, and gender roles. 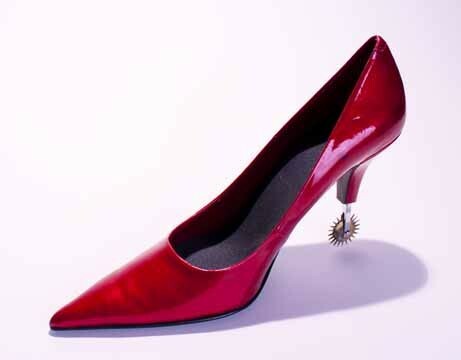 The idea started with a pounce wheel in the heel. the pounce wheel is a tool for pattern making and transferring. I thought it looked like a cowboy's spur. I began to think about how spurs where used to enforce dominance and manipulation. I had also been working with the bright blood red color as a sexual trigger as in the Flower trap. When I came across this red high heel shoe I was taken with it's shapes similarity to a cowboy boot. This to me carried out a nice dialogue about sexual politics, power, and gender roles. The insole of the shoe is made of black sandpaper in keeping with the "grit" idea. I later found the people would often rub their finger along the sand paper, leaving a few skin cells behind. in this way this sculpture has become a repository of the DNA of the people who have interacted with it.